Of a past perfect tense. Martin Tucker is in the quest of close-at-hand, possessable relations denied by the paintings in the museum. This poem is really fascinating, because Tucker is involved with a characteristically postmodern quest of affinity amid the ache, sorrow and unfathomable distance. Martin Tucker’s poetry is full of menacing signs of exile and “emptied out”, which is evident in his poems “Sense of Exile in a Museum”, “The Nature of Exile”, “The Grief and Triumph of Exile”. Tucker’s advice in “A poet’s Directions” is quite full of wisdom... “Just follow the first good line.” T.S. Eliot’s first line in “The Waste Land” “April is the cruelest month…” achieves its unforgettable status only as we travel through “The Waste Land” to our final benediction: “Shantih, Shantih, Shantih” (Paul Cummins). We also find Russo’s three poems both in French and English, taken from his collection The Crowded World of Solitude, which proves that he is an author of great versatility. Russo’s poems are full of the spirit of existentialism. Russo says that every person has “the free will to become good or evil, / just like Abel and Cain” (“You Shall Mark My Words”, 127). Russo’s attitude of “free will” is in keeping with the existentialism of Jaspers who states, "Existenz-philosophy is the way of thought by means of which man seeks to become himself...This way of thought does not cognize objects, but elucidates and makes actual the being of the thinker” (40). I may add that Existentialism was most popular during the postwar period. Beauvoir wrote that "not a week passed without the newspapers discussing us"; existentialism became "the first media craze of the postwar era” (Aronson “Camus and Sartre” 48). No doubt, Russo’s belief in existentialism is unquenchable. The chief interest of “Dramatis Personae” lies in Russo’s excellent power of narrating a story with great subtlety. Adam Powell aptly comments: “Mr. Russo is perhaps most in his element in his story-telling poems …crafted in such a way that the apparent simplicity unveils many layers of descriptive complexity” (15). The Crowded World of Solitude is “a colossal feat” (Powell 16). Russo’s “You Shall Mark My Words”, Holocaust poem, is written on a vast scale exposing the persecution of Jews by Nazis. Alicia Ostriker wisely says that to fall silent in the face of the Holocaust is to surrender to it (SHOFAR 145-48). The poet is marvelously successful in telling the whole truth about the Jews. The whole poem is illuminated by the searchlight of his genius. The poem shows Russo’s innermost consciousness full of questioning note and a wistful melancholy. Russo kindles in us a virtuous enthusiasm for justice “for all those millions of brothers and sisters \ who were treated like animals, tormented then gassed / by the Nazis, who thus perpetrated history’s most diabolic crime” (123). The best thing seems to be to follow Kierkegaard’s sane advice that to love one’s neighbor perfectly as Jesus did is a “the fulfilling of the law” ( 103). “The identity of exile is as difficult—and as necessary—a matter of determination as its other side of coinage: the naming of identity. The search for a stopping place, a finality of identity, is likely to go on and on, for identity, particularly once exile strikes in its virulence, is vulnerable to alloyment and impurity” (11). Tucker’s critical essays show great penetration and subtlety, and appeal directly to the minds of the readers. This essay also vividly presents before us some important features of his monumental work Literary Exile in the Twentieth Century: An Analysis and Biographical Dictionary (Greenwood Press, 1991), a study of the impact of exile on writers in the twentieth century. 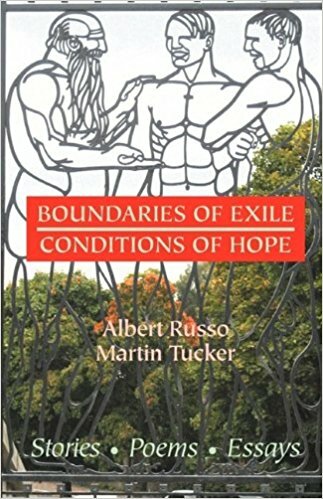 Tucker remarks: “Literary Exile in the Twentieth Century was an exploration of the surfaces of exile, the outer grounds and borders identifying its exits and refuges of new land” (10). He rightly points out several causes of exile—Political, Religious, Cultural, Sexual, Personal/Social, Exile by Accident, Exile to Avoid Criminal Prosecution, Medical/Career/ Education, Legal (Tax Reasons and Other). “Go back to the Roman conquests, to the Portuguese and Spanish explorations, to the Ottoman Empire, to Stalin, Mao Tse Tung, Pol Pot, Idi Amin, Bokassa, and more recently, to our own Mobutu . . . and you will conclude like me that Power and Greed, as evil as they can get, are unfortunately a staple of human nature. And that we have to fight this with all our might (36). The above extract shows Russo at his best, the attacker against “Power and Greed”, and sordid realities. The predominant note in Russo’s portrayal of ethnic strife is full of sadness, and it has meaning for us still. “A few years later, however, ethnic strife would shake Burundi to the core, a foretaste of the terrible events that would rock neighboring Rwanda, with the mass killing of five hundred thousand to a million people, mainly of Tutsi origin. And what about the five million dead Congolese (some put that figure at six million or more) and the other millions of displaced people in Kivu within these last years?” (54). Russo feels that Nelson Mandela provides a ray of hope. “We need, not one, but two, nay, a dozen Nelson Mandelas to save us from man’s folly” (55). Nadine Gordimer , South African writer and Nobel Laureate for Literature, shows the similar feeling as she writes about Nelson Mandela, "He is at the epicentre of our time, ours in South Africa, and yours, wherever you are." When Mandela was freed, Nadine Gordimer was one of the first people he wished to see. Assessments and Bibliographies includes critical assessments and detailed bibliographies of Albert Russo and Martin Tucker. This makes us acquainted with the whole range of their works upon a great scale. The rich and comprehensive information provided by Assessments and Bibliographies makes the book very useful for students, Research scholars, academic and public libraries. No doubt, after reading Assessments we come to know about considerable powers of Tucker and Russo, and their works linger longer in our memories. “Albert Russo and South Africa” by Leslie Schenk shows that Russo is a very great artist, and his nationality is difficult to be categorized. Schenk rightly says that as a writer, he is simply uncategorizable by nationality (132). Like Shakespeare, Albert Russo in his creative works paints life as he sees it, and leaves others to categorize him. This makes him the permanent possession of global literature. This is evident as Leslie Schenk further reminds us: “Russo writes in American English and in French and has published over three hundred poems, short stories, and essays in Australia, Belgium, Britain, Canada, France, India, Nigeria, Sri Lanka, the USA, and Zimbabwe, plus five novels so far published solely in francophone countries” (132). Schenk further quotes Russo about his bilingual works. Russo is very clear in his choice of English or French language. In an interview, Russo clarified: “The theme and the emotions of the moment impose their chosen language upon me. When I feel too engulfed in workaday material difficulties, I want to distance myself from them. At such times it is language that distantiates me, and it is English that chooses me. When I feel elated, it is French that nudges me on to write. Language and I have affinities that are not at all logical or rational” (133). Albert Russo is indeed a genius, turning both languages into gold. None dare claim equality with him as a bilingual author. Assessments also includes critical evaluation of Martin Tucker: “Critical Excerpts on His Work”. The critical excerpts reveal unmistakable evidences of remarkable contribution of Tucker to the world of literature. For example, the critical excerpt from Booklist, October 15, 1991 is a very rational and balanced analysis of Literary Exile in the Twentieth Century: An Analysis and Biographical Dictionary, written and edited by Martin Tucker (Greenwood Press, 1991), which is intended to be “a representative survey of the modern writer in exile.” Literary Exile in the Twentieth Century provides a unique and fascinating perspective on expatriate writers that cannot be gleaned from any other biographical dictionary. There is no doubt that this is the most striking book dealing with a comprehensive analysis of character of famous authors in exile like Samuel Beckett, Joseph Conrad and Vladimir Nabokov. Another interesting information about Tucker’s monumental work is found in an excerpt from Stella Hershan, in “Books,” Austrian Information, Volume 44, No. 7/8: “The awesome and momentous legacy of Exile Literature is rescued from obliteration by this exhaustive volume [Literary Exile in the Twentieth Century] chronicling the lives and works of global writers who enriched the minds of all world citizens of the twentieth century” (150). These critical excerpts succeed in providing an intimate analysis of Martin Tucker’s extraordinary Dictionary. D. H. Melhem’s Foreword to Martin Tucker’s Plenty of Exits: New and Selected Poems, 2008 belongs to a class apart, as it is an exploration of the poetic essence of Martin Tucker. “The gemlike wit is there, epigrams and puns that radiate throughout the language, along with the wisdom of memorable lines like “Those years never lived never die” and “I cannot forget what is impossible to remember,” both from his poem, “The Missing Father”(151-52). The critical excerpts are the finest examples revealing most conspicuous features of Tucker as an editor and author. Dryden said about Chaucer, “It is sufficient to say, according to the old proverb, that here is God's plenty.” We are quite justified to say about Boundaries of Exile, Conditions of Hope by Albert Russo and Martin Tucker: “Here is God’s plenty.” This is one of the most brilliant and comprehensive books, dazzling in its range gathering together the full measure of Albert Russo’s and Martin Tucker’s genius. Cummins, Paul. “First Lines”, Santa Monica Mirror. Vol. 11, April 20-26, 2009. Joyce, James. A Portrait of the Artist as a Young Man. Penguin Classics. (Paperback), 2003. Kierkegaard, Soren. Works of Love. New York: Harper Perennial, 1964. Liba, Moshé. “A Trilogy by Albert Russo”. Taj Mahal Review, Cyberwit, June 2009.